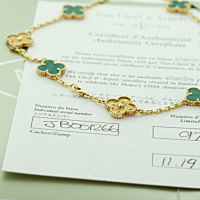 This rare limited edition malachite vintage alhambra necklace by Van Cleef Arpels was one of 100 pieces made in this unique pattern. 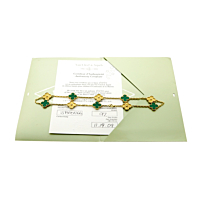 The signature Alhambra four leaf motifs are double-sided and crafted in both 18kt yellow gold and malachite. Connected by an 18kt link chain, they alternate on an 18kt yellow gold link chain.